A lot of people criticize the Hobbit trilogy for not being faithful to the book. And, that’s true. A lot of people also use the quote from the Fellowship of the Rings that it’s like “sort of stretched, like butter scraped over too much bread.” That’s also true. But there’s a worse sin about this movie. It’s too long. After hour two, I was losing interest. Peter Jackson is the master of showing, not telling, things. That doesn’t happen here. Thorin is supposedly being driven mad by the treasure. And it’s not subtle in the least. It’s blatant, beat-you-over-the-head moments. I truly enjoyed both Peter Jackson’s Lord of the Rings trilogy, and the original Hobbit book. But I haven’t enjoyed The Hobbit: Battle of the Five Armies, sad to say. ﻿ There are positives about the movie. The acting is fine, and the entire cast does a good job. Many of my favorite actors appear and do their best in their roles. The sets, cinematography, and costumes are excellent all around. Academy Award®-winning filmmaker Peter Jackson returns to Middle-earth with the final of three films based on J.R.R. Tolkien’s enduring masterpiece. 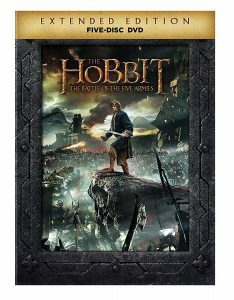 Set in Middle-earth 60 years before the epic Lord of the Rings trilogy, the adventure follows the journey of Bilbo Baggins, who is swept into an epic quest to reclaim the lost Dwarf Kingdom from the fearsome dragon Smaug. Approached out of the blue by the wizard Gandalf, Bilbo finds himself joining a company of dwarves on a journey into wild, treacherous lands swarming with beasts of every ilk. After reaching Erebor and encountering the dragon Smaug, Five Armies assemble for an epic battle that could decide the future of all in Middle-earth. The Extended Edition film is 20 minutes longer with new and extended scenes not seen in the theatrical release.